The Ghiannis D is north of Sha'ab Abu Nuhâs reef, in the Strait of Gobal. Read more about the Ghiannis D.
Please click a photograph for an enlargement and details. All photos copyright the photographer - Tim Nicholson. Ghiannis D shipwreck by Tim Nicholson. 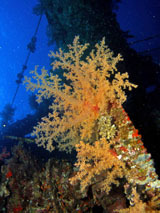 Soft coral on Ghiannis D shipwreck by Tim Nicholson. Prop Ghiannis D shipwreck by Tim Nicholson. Engine well on Ghiannis D shipwreck by Tim Nicholson. Bow of the Ghiannis D shipwreck by Tim Nicholson. 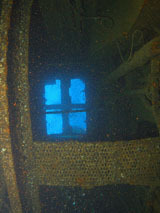 Stern of the Ghiannis D shipwreck by Tim Nicholson. Stern of the Ghiannis D winch by Tim Nicholson. Ghiannis D workshop by Tim Nicholson.